Henry Investment Partners are strong proponents of creating stronger communities through the successful collaboration on important public and private goals. This often takes the form of integration of transit or transportation facilities, parks, open spaces and flexible streetscapes into the projects, to provide both a successful environment and stable new tax base. Many of the firm's projects are less than a mile from an existing or planned transit facility, permitting the intelligent concentration of density and services where the automobile is no longer essential for many trips. 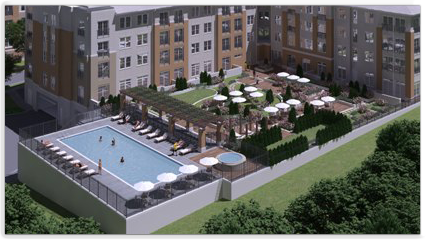 Majestic, Spectrum's third luxury apartment building, is now available for lease. The new Moroccan-themed building doubles amenities such as resort-style saline pools, 24/7 gyms, and entertainment rooms for residents of Spectrum.